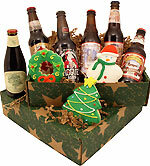 Anchor's Christmas Ale is a real holiday treat because the brewers select a new tree to grace the label each year. This makes each bottle a treasured memento, so don't gasp in surprise if your gift recipient decides to save the last bottle for memory's sake. 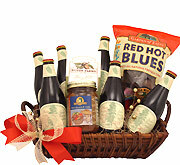 While this basket makes a great Christmas gift when you can't get back home to treat someone special to a proper holiday drink, don't limit yourself to the expected gifting scenarios. Tis' the season to step out of your comfort zone and send someone a surprise just because you can. 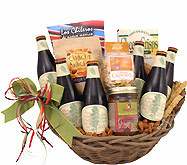 You can have this basket delivered in advance of a holiday party because it makes a memorable hostess gift. If you have a hot date at the end of the year, this is also a great way to kick of the evening.